Maiaz Rahman recently contacted me about his puzzle app game: Grid Puzzle the Brain Training Game. It is a Nonogram type puzzle, which we've seen many times before. One nice feature: you can get a hint about where one of the pieces goes. Another nice feature, which I believe is unique among the Nonogram type puzzles: a randomizer. If you're stuck, you can push the randomizer button and that will scramble the tiles while preserving the ones that are correctly marked. It's very cool. I played/solved about 20 levels. On more than 1 occasion, there were multiple solutions. There's a lot of interesting graphics & bells & whistles. If you've been following this blog, you know that I always deem that as secondary to the actual puzzles. In this case, it takes too much time to go from 1 puzzle to another. But I understand and appreciate that others would like that. The credits show that a lot of people worked on this. Did I mention that Grid Puzzle the Brain Training Game is free? There's a mechanical puzzle called Mad Triad. The object is to swivel the center circles to rotate the triangles around. Magic Hexagon Ultimate is from Pham Quang Viet and does exactly what Mad Triad does. Mad Triad was a commercial failure because it broke too often and stores got too many returns. This app has another challenge mode where you must solve the puzzle within a given number of moves. Diego Acevedo is the author of The Impossible Dodging Game. The object is to place your man, a small square, anywhere on the board and then dodge the oncoming traffic of rectangles that fall from above. You can slide your man side to side & up and down. I like this game a lot because things start off nice and slow and very gradually speed up. My high score so far is 279. This is the kind of game where I say I'll play it a few times, but end up playing it for a month. Recently I discovered Percepto which came out 2 or 3 years ago. Percepto is very difficult to describe. Here goes: your task is to get your man to the exit (the white door). You can perceive the blocks from 4 directions as you rotate the room. Tap to shrink the room to a 2-D space and if the blocks line up, your man can travel to another block. You will have to go back to a 3D perspective, check all 4 different views, and shrink it back to 2D again. Essentially, Percepto is a very sophisticated series of mazes. Major kudos to Daniel Hooper for this excellent puzzle game design. The staircases are self explanatory. The red buttons turn on and off blocks that will travel up, down & diagonally. Back to Perspecto: right now I've completed 38 level and I'm stuck on #39. Altogether there are about 40 levels; Daniel's not sure. I really like Perspecto! Recently, I became a fan of CrazyBadCuber. His reviews of new plastic twisty puzzles are excellent. 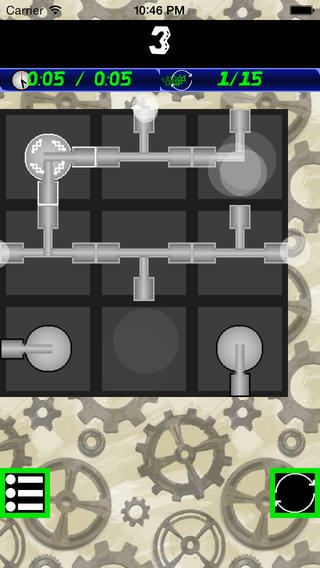 We've seen many 'connect the pipes' type puzzle apps. Connect Infinite comes from Glen Dizon. The object is to rotate the pips, in their fixed places, so that no steam escapes. I did the first 25 or so levels rapidly while watching the news. I checked the leaderboard and saw only 50 players. A couple of things are different: see the double pronged gray pipes? That's new. Look at the yellow shapes: those are pipes that must be connected - but you don't know what the opening/closing valves look like. Big surprise: see the red circles? Tap on them once and that whole square region will rotate. Very interesting. One negative element: each time you start a new level, the top of the puzzle is obscured by that blue bar with the time. I didn't realize, until level 60, that you're supposed to drag the playing field down. Ugh. Major Surprise: Starting at level 76, there are red circles, whose squares share some pipes. This means that pipes can migrate from one square region to another. At this point, Connect Infinite becomes a serious, hard set of puzzles. Want to make some money in puzzles? Are you a great programmer? Want to make some money in puzzles? The Grabarchuk family is world famous for creating all types in vast quantities. I particularly liked their app: Strimko. It's a Latin Square puzzle. Each row & column should have the numbers 1-5. Also, each string of circles should also have the numbers 1-5. I particularly like the larger grid sizes. Let's talk business: Peter Grabarchuk is looking for investors for their MASSIVE COMPENDIUM OF PUZZLES, which they call PUZZLIUM. 2 months ago, they came to the New York Puzzle Party Symposium and made their demonstration/pitch. I was the guinea pig that day. Puzzlium is beyond humongous and good. 'Puzzlium's mission is to release people's creativity to make the world smarter. Founded in 2014 by Serhiy Grabarchuk, Serhiy Grabarchuk Jr, Peter Grabarchuk, and Mehmet Murat Sevim'. So far they've raised $72,000. I'm friends with 3 of the investors. Also, they are looking for great programmers. Go to the link at the bottom to see more. If you do end up working/investing with them, do let me know. 5) build all social algorithms based solely on the participants' interaction. I. Solving puzzles - interactively. II. Creating puzzles - easily. III. Competing with other - socially. Puzzlium's mission is to release people's creativity to make the world smarter. Founded in 2014 by Serhiy Grabarchuk, Serhiy Grabarchuk Jr, Peter Grabarchuk, and Mehmet Murat Sevim. A story: when we were kids, our father taught us Pinochle. We never knew anybody else who played the game. We had marathon sessions - always when we were on vacation. One day, my father saw a classified ad about a Pinochle tournament. But the phone number was wrong. My father theorized that it could've been a case of espionage: when a spy completed his mission, he would place a classified ad that nobody would pay any attention to. Pinochle HD has a rule that we never used: after the bidding is complete, the partner can pass 4 cards to his partner. The bidder gets to see them before passing over 4 other cards. Also different: the opening bid starts at 250. I played Pinochle HD for about 30 minutes. I really like it.....but I'm not sure that the program is people smart. I let the person to my right win the bidding and he picked spades as trump....I had 5 spades including the ace and two tens. I've lost track of how many robots have broken the record for speed cubing. This record is going to stand for a while. Tired of Sudoku? Me too. 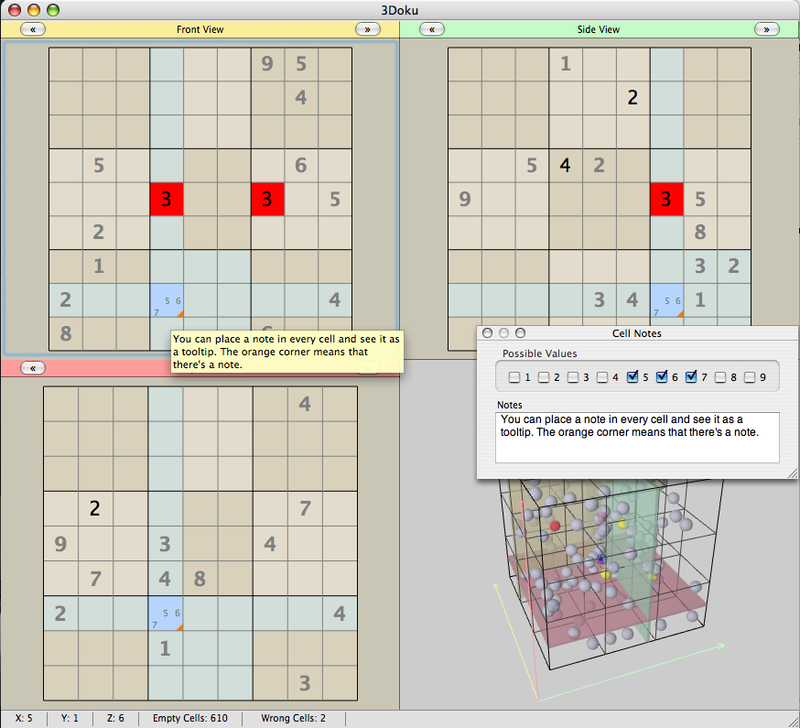 But recently Simone Tellini sent me a promo code for his 3D version of Sudoku which he calls 3Doku. It's MONSTER SIZED. The idea is to solve 27 Sudokus simultaneously. 9 in each direction. Look at the bottom right image. All of those white dots represent numbers that have already been filled in. Now look at the other 3 images: you will view those grids at the same time. So, if a 6 works on the x-axis grid, you will have to confirm/prove that it works on the y & z axes. I solved 1 puzzle at the 'Easy - I'm just learning the game' level and it took a while. A few minutes to figure out the controls. Then I'd say it took another hour or so to complete it. If I didn't have so many other puzzle app games to play, I'd give the harder levels a go. 3Doku is $.99. Do it to prove your brainpower. At the very least, it'll impress your friends. Especially if they're playing that stupid Candy Crush game. My instinct when seeing this kind of graphic - stay away - it's just for kids! Nevertheless, I got an email - spam, really, talking about how there are 120 levels and you have to get Croco to escape. Here's the deal, it's a rectangular version of Rush Hour. Croco starts on the left and must get to the exit. You have to move the obstacles. I did the first 20 levels and the program told me I couldn't go on because I didn't get 3 stars for each level. I don't know how I didn't get 3 stars. Nor do I really wish to go back to earn them. The graphics are a bit clumsy and I've already done a few thousand of these Rush Hour types before. There was one thing that was cute - when Croco gets tot he exit, he looks up at you, presumably to say thanks. Croco's Escape is strictly for kids. Simone Tellini recently contacted me about his puzzle app game Pathle. (The word is a combination of Path & Puzzle.) Essentially, it's a topology puzzle game. We've seen many of these types before. Here's what you have to do: trace your finger over all of the dots passing over the lines once. Sorry, no image available now. When I was a kid, drawing a house using these rules was quite popular. It consisted of 4 dots making a square and a fifth dot above the square. I studied some topology in college and can do these types puzzles very quickly. There was a similar app from about 2 years ago - any time I couldn't sleep, I'd do them. I don't remember the name of that app. Interesting feature: some lines must be passed over twice, or three, four and five times. Pathle is fun, free and definitely worth some of your time. There are 250 levels. Right now I've done about 105 of them and took 2 hours. At the moment I'm second on the leaderboard. Update 4/14/14: I finished all 250 puzzles with an average time of 39 seconds per level. However, those times did not include the times where I made a mistake. Altogether I spent a little more than 3 hours. Desmond Lee recently contacted me about his puzzle app game Caveboy Escape. It's a maze game. The object is to get the caveboy from the bottom star to the arrow on top. He must travel on like colored tiles in groups of three. For example, he can travel brown, brown, brown, gray, gray, gray, tan, tan tan. I have 1 qualm. When I step on a brown tile, it changes its shade so I sometimes loose track of things. But it's a minor complaint. There is a time limit to solve these puzzles in groups of threes. There are some 500 levels which translates into 1500 puzzles. But they go pretty fast. I played the game yesterday for about an hour and solved about 75 levels. They're fun! I did get stuck a bunch of times, so that's good. Ryan Ding recently contacted me about his puzzle app game Lost Lands - a Treasure Hunt Puzzle Game. It's very similar to the game Turnstile from ThinkFun: http://thinkfun.com/turnstile What's different? Lost Lands has a bigger board and a whopping 168 puzzle levels. The object is to move your man from the top left corner to the bottom right corner by swinging through some gates at the intersections. Note: the gates only move 90 degrees, so it's possible that you won't be able to push a gate. Right now, I've done 38 of the 168 levels. I got stuck on a bunch of them, but persevered. Here's how the game could be improved - graphically. The squares - make them smaller and make the intersections larger. Lost Lands is a good puzzle game app. Young puzzlers will like this. You may have noticed that I've been slowing down on the puzzle app reviews lately. That's because I've been playing Threes! every day. My highest tile: 768, which I've gotten at least 75 times. As soon as I get the 1536 tile, I'll quit. Slide Five is the latest clone. The first successful clone was 2048, whose rules are a bit different. I got up to 1024 after playing it 4 or 5 times. I'm sticking to Threes! I will say this, the graphics on Slide Five are faster and they're pretty slick. Slide Five sticks pretty closely to the rules of Threes! The differences are pretty obvious based on the images. Here's where I'm stuck at Threes! and Slide Five: what's the highest new tile that will be given. I'm pretty sure that in Threes!, it's 1/8 of whatever your current high tile is. In Slide Five, there is no '+' hint that signals, you'll be getting something higher than a five. I've said many times, if you like a game, go ahead and pay for the upgrade - at least as a reward for the time you've been entertained already. In Slide Five, the game is free and you can pay $.99 to remove the ads. In this case, spend $1.99 to the true authors of the original game - Threes! If you've been following my puzzle app blog lately, then you know that I positively love Threes! 2048 came out about 3 weeks ago and may have overtaken Threes! in popularity because it was available to play online and now that it's an app, it's free. Eights! Match Pairs....is another clone of this game. I'm not crazy about this for 2 reasons. First, the graphics are not as good. Second, look at the title! It's not just trying to piggyback on Threes!, it's also hanging on to 2048. Does the name Sid Sackson mean anything to you? Sid invented hundreds of board games. About 5 years ago I got a chance to play Can't Stop which is a gambling game that doesn't involve money. You are given 4 dice and must use them in pairs to advance your men up the board. You will want to keep rolling, but if you don't make your numbers, you will lose the progress you made on that turn. The app version is a whole lot cheaper than the Real McCoy on ebay - usually in the $20 range. I like this game app. Some people like the smell of freshly printed money. Or the smell of Napalm in the morning. Others crave a brand new plastic twisty puzzle. Aaahhhhhhhh. Buzzle Ball http://www.buzzleball.com/ is the latest. The green and blue hemispheres can slide around within their own section. Think horizontal movements, but not vertical movement. The white pieces and the narrow green & blue rectangles can slide around when a complete circular route has been established. This is done by swiveling the north & south poles. Here's what I really like about Buzzle Ball: I've fiddled around with it for an hour or so and have not solved it! Also, I should add that Buzzle Ball has a good feel. Here's what I think could be improved on. First, the colors. Is it green or aquamarine or teal? Second, the size is a bit too large. Back in the old days, like 1994, when I got my first Gateway Computer, I became an expert at Minesweeper. For a variety of reasons, I've moved on.